Cockroaches can get into your home through cracks, crevices, vents and drains. They are usually attracted to your house by the presence of food and water. Therefore, denying them what brings them indoors can keep them away. There are many types of cockroaches you may find with their differences usually in color and size. If you are struggling with cockroaches in your house, a professional cockroach exterminator might be all you need for complete cockroach removal. Eliminating cockroaches is an arduous task because they can hide well during the day and only come out at night. They are some of the hardest pests to kill and have been taunted to even be able to survive a nuclear holocaust. However, it doesn’t mean that you have to live with a cockroach infestation in your home. Cockroaches can cause diseases by getting into contact with your skin or contaminating your food without your knowledge. This is due to the indiscriminate feeding behavior of the cockroaches. They can feed in places where they come into contact with disease-causing organisms such as sewers and drains and then bring the organisms to your house. Therefore, the need for cockroach extermination services goes without saying. Getting rid of a cockroach infestation might not be easy or safe as people think. This is why you need to use the services of a professional cockroach exterminator. A cockroach exterminator is trained on how to effectively and quickly get rid of cockroaches. Not only that, they have many different methods they can use and will leave you with tips and tricks you can employ to keep an imminent infestation at bay. Most people only think of using pesticides to get rid of cockroaches, but the harmful chemicals in pesticides contain toxins that may harm you or your pets.A cockroach exterminator employs green methods to get rid of an infestation without pumping your house full of chemicals. The best way to keep your home cockroach free is by adopting preventative measures. For instance, keep your house clean and debris free all the time. Ensure that food remains are stored in airtight containers. Also make sure you remove pet food from trays and clear any water lying around before nightfall. De-clutter the house and avoid stacking old things in your home. Furthermore, if you notice entry points of cockroaches from outside, seal them up. A cockroach removal process starts with thorough inspection to determine its severity. The inspection can also help determine the best methods for roach removal. However, a cockroach exterminator often employs different methods for effective results. A good long-term solution to cockroach eradication involves using both preventative measures and professional cockroach removal to get rid of infestations you may already have. 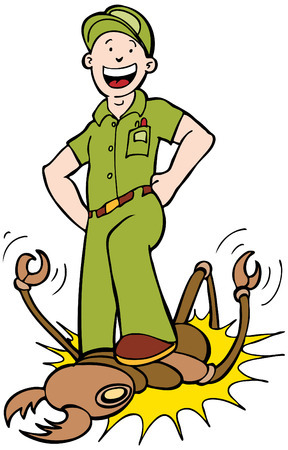 Call the St Petersburg Pest Control Pros for the best cockroach extermination services in the St Petersburg FL area. We are the top local pest control St Petersburg FL company.